Easy. Start with dinosaurs, finish with giraffes. We have two summer birthdays in our family. My son Emmett and my mother-in-law Joyce have back-to-back July birthdays, which we frequently celebrate together during summer vacation. Before you shed a tear for the poor child who never gets to bring cupcakes to school for his birthday, please know that he ends up with multiple celebrations of his joyful birth each year – one with friends in California before our trip, and another celebration with Pennsylvania family on the real day. 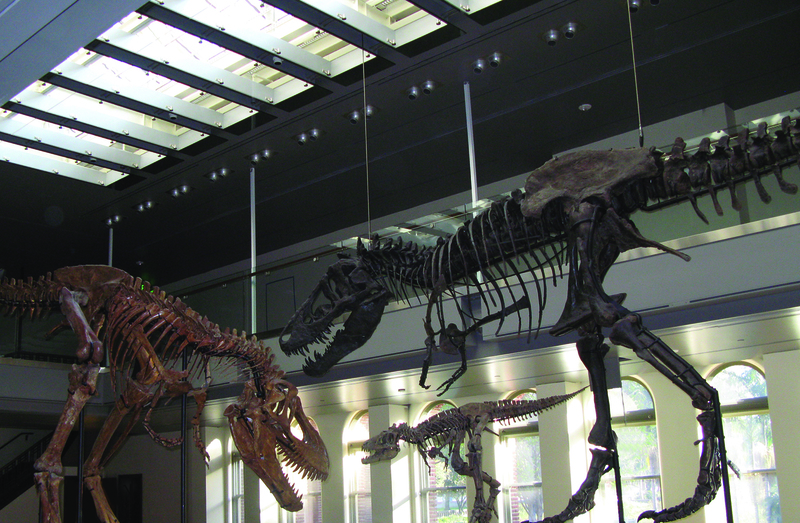 This year his dream was to have a sleepover at L.A.’s Natural History Museum in its New Dinosaur Hall. I don’t know how brave you are, but I would be skittish sleeping with a T.Rex triptych – baby, juvenile and full grown – hovering over me. So I didn’t expect a single friend to jump at this idea. 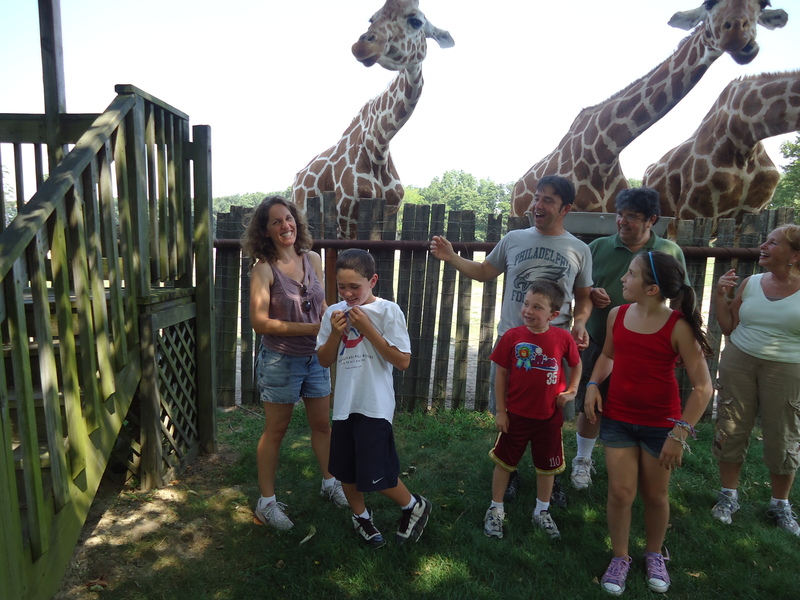 Instead, we told Emmett we’d take him to see the dinosaurs, and another day he could have a party with friends at home. That is how he ended up with three birthday celebrations: those two events and on his actual birthday, a Six Flags Wild Safari V.I.P. Tour in Jackson, New Jersey. All together now: Life is good. As an Angeleno, I’m particularly proud of our new dinosaurs. The Natural History Museum keeps getting better, far surpassing my childhood experiences of it. For years we watched scientists patiently build these dinosaurs, and they have finally come to fruition, along with a lot of interactive exhibits. My favorite is a video of the self-taught paleontologist whom L.A. County long ago sent to Montana in search of its own T. Rex, rather than purchase one already unearthed by another institution. Later they may host birthday parties, but until then, just bring a picnic and a soccer ball and have a party outside on the massive lawn. Happy Birthday Part 1. The only animals involved in Happy Birthday Part 2, were the dozen six-year-old boys running around playing Red Light/Green Light, jumping on a trampoline and eating pizza and cake, so let’s skip ahead to Happy Birthday Part 3. We all use Emmett’s passion for animals to connect us to our own animal instincts. 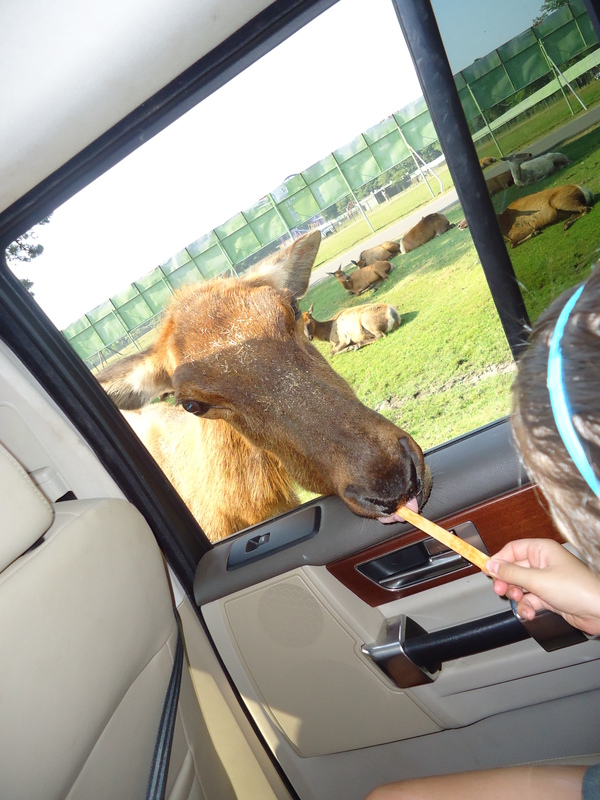 While most visitors to Six Flags Wild Animal Safari in Jackson, New Jersey drive their cars through meandering dirt roads throughout 350 lush acres, past 1500 animals representing 52 species from 6 continents, ogling creatures from bison to Bengal tigers, and from emus to elephants, those guests are required to stay in their cars with the windows rolled up – just in case. We splurged for the V.I.P. tour, which allowed eight of us to get in and out of our two guided Land Rovers (painted like zebras), stand within three feet of lions and tigers, pet Roosevelt Elk, giraffes and a rhinoceros, and feed various animals fruits and raw vegetables as we went. 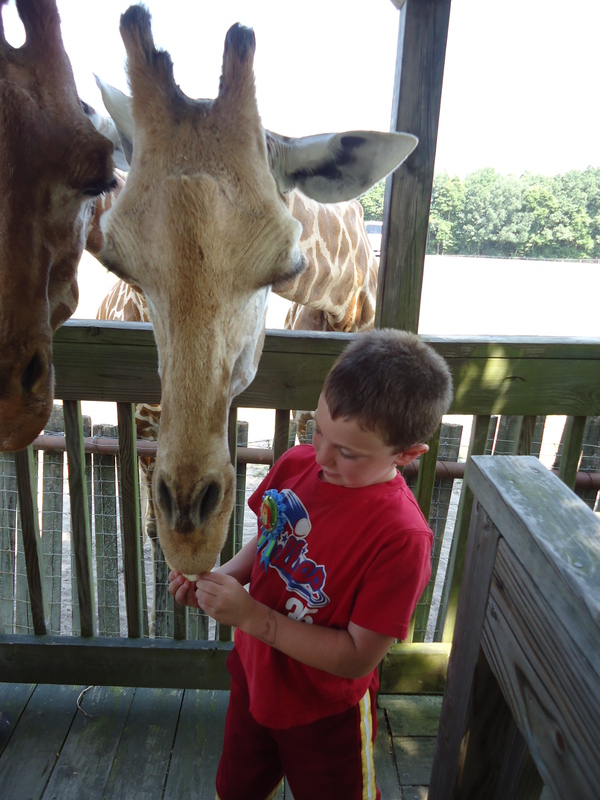 I have never seen my children voluntarily let a raw sweet potato touch their teeth, until today, when they decided to feed the giraffes mouth-to-mouth. I think they would have taken them home with them if we could have sneaked them out. Animals aside, Emmett was over the moon simply because he got to sit in the Land Rover’s front passenger seat, another birthday perk. And so the first day of our two-month travel adventure begins with a theme we hope will carry us through: experience the unfamiliar, get out of our comfort zones. I must confess, however, that as I write this, I am quite comfortably sitting in the air-conditioned home in which I became engaged to my husband nearly 14 years ago. So there you have it: a perfect balance of creature comforts and wild creatures – and another birthday to remember. What a spectacular birthday. Of course, the hard part will be topping it next year LOL.